June Theme Day for the City Daily Photo Community is "The Beauty of Decay." You can view other interpretations of The Beauty of Decay by clicking here. My contribution is building that was in decay, but is being restored, but you can see echoes of its former life. The old and the new work well in monochrome. Love the hint of its past and hope the restoration brings back this lovely old brick structure. I always think of beautiful brick when I think of Boston. I love to see faded write on brick buildings. It just seems so nostalgic. Wonderful post. Thanks. Great nostalgic photo, and glad to know that the building is being restored. I do hope that they leave the "ghost sign"
Great ghost sign and good to see the building being saved! A very dramatic shot. Like it loads. This building seems to be good enough to have a second life.I'm glad that it will go on some years more. I always like to read the word "Restored!" We call these Ghost Signs down here. Nice capture and love it in BW. This old building has many miles remaining in its tank. Beautiful choice for theme day. So happy that this old beauty is being restored Jim, would have been such a waste to abandon it totally! the ghost sign is a real bonus! Always glad to see decay repaired in buildings that make them useful for many more years. I love the ghost sign! I hope that they keep some of the charm in the renovations, it looks like a gorgeous old building. 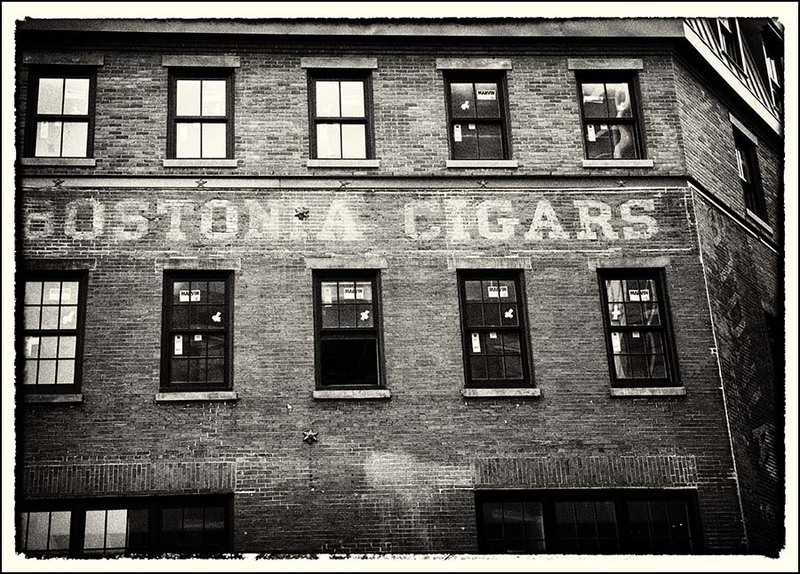 Bostonia Cigars was owned by my Great-Great-Grandfather, Frank X Oberle. He immigrated from Germany in 1876. Thank you for posting this great photo!